Commissioned by artist Bonny Snowdon it was a huge honour to be asked to do this commission. 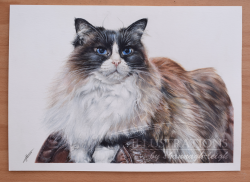 Peggy was a beautiful cat to paint I fell in love with her deep blue eyes and her fur has so many different gorgeous colours. I thoroughly enjoyed painting this sweet lady!